In most cases, when You order a Background Check either on yourself or on a potential employee, they are completed within 2-3 days. And, depending on what you need verified, it can take as little as 24 hours. This can range from problems with the courts themselves to sources not responding in a timely manner. No matter what the case, it can be frustrating for both you and your background check company. You are concerned with getting the information quickly in order to make the hire you need. Your background check company understands this. After all, their focus is on providing you with the best and most timely response. But since outside factors can delay the process, it is best that you are aware of what they are and what can be done, if anything, to get your check back on track. 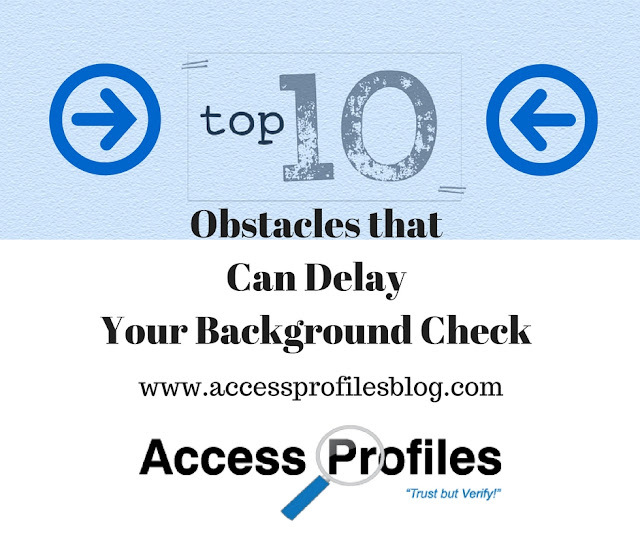 10 Obstacles that can Delay Your Background Check! "Tweet This"
When a screening company is given error filled applications or resumes, weeding through them can be time consuming. In addition, hand written forms are often hard to read or do not come in clear when emailed or faxed. 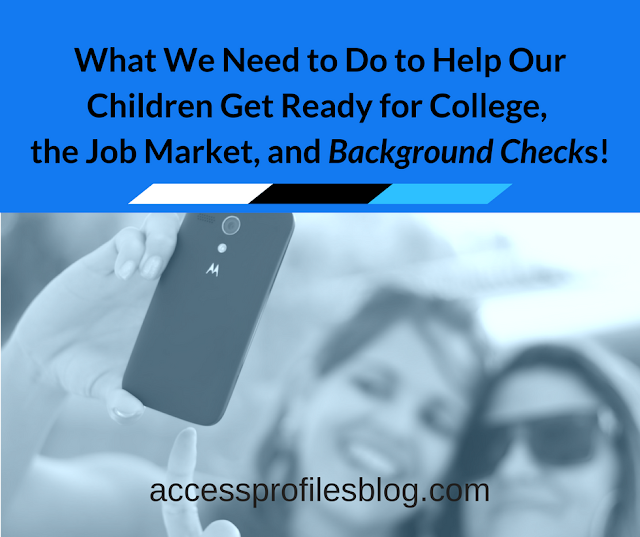 Solution: If the background check is on yourself, make sure your resume is “background check ready” (You will find tips to accomplish this here). 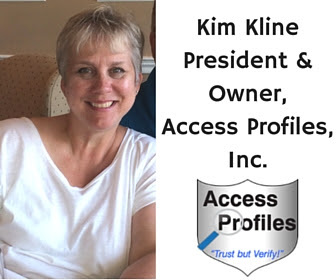 If it is on a potential employee, stress to the applicant beforehand that any errors on their application can cause a delay in completing their background check ~ resulting in stalling any hiring decisions. This might prompt them to make any necessary changes or write more clearly before submitting. Sending your work request to a background check company late in the day, or right before a weekend or holiday, can most certainly add to the turnaround time. Sources will often be hard to reach. things are winding down for the day, etc. Solution: Requests sent earlier in the day or mid-week (Tuesdays through Thursday) are best. If that is not possible, you should expect a slightly longer timeframe for responses, especially where verifications from employers or references are concerned. Solution: There really is no substitute for manual checks in courts that have no databases (or those whose databases are not up to date). 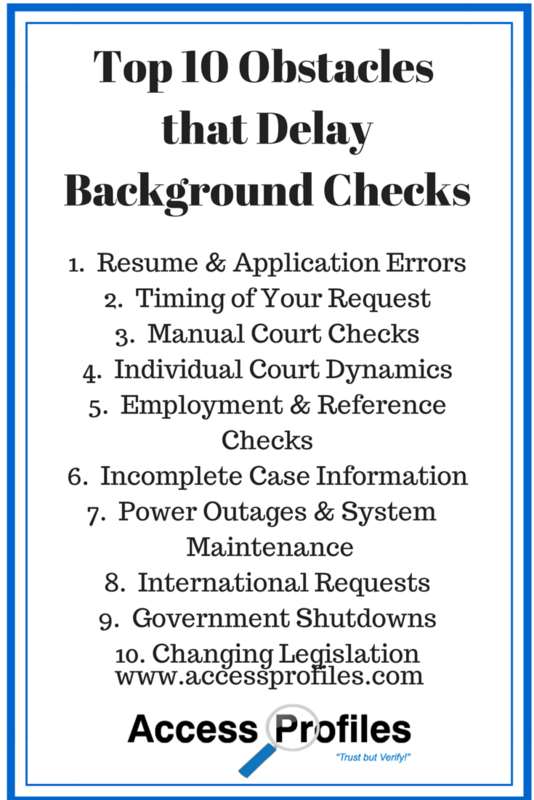 Your background check company will most assuredly advise you of the delay, but this is one time that you simply have to wait it out. Solution: Once again, this is out of anyone’s control. Despite the push for courts to be more diligent about updating records and databases, the reality is that lack of funds for new hires make this a difficult task. Verifications of past employments and references can be problematic. While many companies use online databases to verify dates and title of employment, directly speaking to a past supervisor is a goal. And there is no substitute for references. Therefore, a screening company is at their mercy. Solution: Make it as easy as possible for any employer or reference to provide the information you need. This means that when contacting them, leave a detailed message as to the subject’s name, what information you are seeking, a timeframe when you will need their response, and a good contact name and number. In this way the source can prepare and will recognize the necessity of a timely response. I have had much success with this method. There are times when final dispositions are not listed. Perhaps the information has not been logged into the record, the case is active, or it is on hold. All can take extra time for any verifier. Solution: Additional research is necessary. Since your goal is to have the most accurate information, there is no way around this. Your researcher will need to make inquiries to see if there has been any recent activity on the case. Checking lower courts, probation records, etc. may be required. There are times when online records are unavailable. There may be a power outage or system maintenance. Both can effect the timeliness of your background check. Solution: You have no choice but to wait it out. Weather related outages cannot be predicted and their return cannot be hurried. Luckily most system maintenance is done during off times and causes minimal delays. Needing information from another country can pose its own unique set of concerns. Language barriers, lack of computer records, differing legal systems, all can cause delays. Even inequities in job titles and degree certification can be problematic. The availability of Criminal and civil court information is subject to a country’s laws and regulations. Some countries only maintain paper records at the local jurisdictions or police departments. Others may have databases, but their standards of accuracy can vary. And still other countries may not allow access to criminal records at all. Solution: Contacting the embassy of your country in the nation in question is a good first step. It will help you find out if the government has public criminal records or even permits them to be searched, solving part of your problem. For employment records, dealing with an international company helps. It is then possible to contact the branch in your country to verify or at least obtain a good contact number for the information you need. However, there are instances when it is either not possible or too expensive to verify everything on an applicant’s resume. Having the subject provide their own proof may be necessary in these circumstances, but even those records can be suspect. A government shutdown at any level can effect your background check. This shutdown is most often a result of court holidays (short term), but can also stem from the inability to agree on a budget (which can be for a longer amount of time). At a federal level, this can cause problems when needing to verify citizenship and social security checks. Solution: Government holidays really are short term and should be no cause for concern. However, longer term shutdowns are definitely problematic. No one can predict when these records will once again become available if the lack of manpower funds stops work. The only thing you can do is verify the information you can, and wait on the rest. There will be court records available at various levels and verifications of employment and references will most likely not be effected. Ongoing changes to EEOC guidance and state & local laws has definitely changed the timeframe of background checks. Many states require a conditional offer of employment first. There is also the need for stand alone release, notices of adverse action, etc. that need to be followed. Compliance with these regulations is necessary to avoid litigation and must be part of all hiring practices. 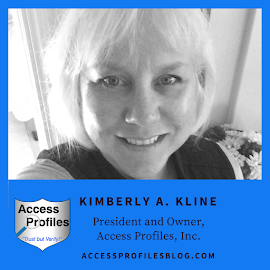 Solution: Address compliance concerns early and stay updated on any passed and pending legislation. By doing this it is possible to put practices into place in advance and not cause you any additional screening delays. 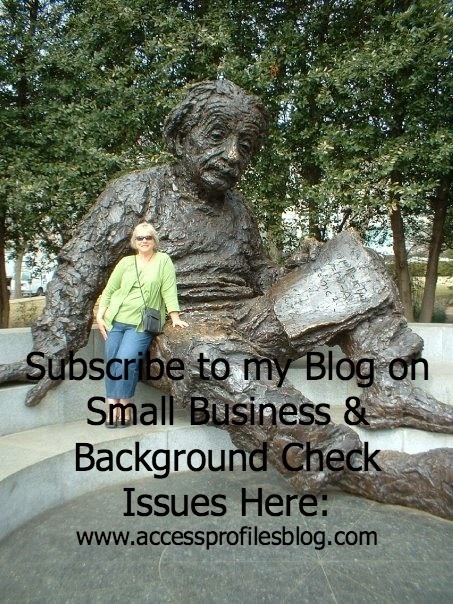 The key is for your background check company to keep you in the loop on what you need to do. You can find out more about Tips to Help Your Business Fly Under the EEOC Radar here. is more important than speed in the long run. We will Help You Hire Safely and Effectively for Your Business! about Business Hiring and Blogging. You are most welcome Bree. And thanks for taking the time to read my article! Have you ever been plagued by any of these delays? Let me know!